The news that the debt ceiling deal is very close is the reason behind the sharp move. If we gap up big at the Monday open, it could lead to a nice fading opportunity. Here is a chart of the 120 minute all sessions S&P Futures. 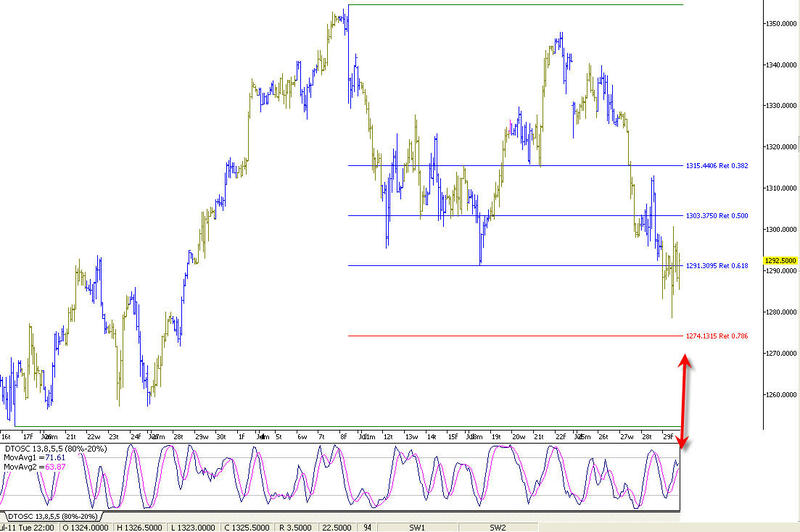 I came into Friday watching this key Fibonacci level and the DT oscillator for a potential buying opportunity. The DT oscillator turned early, and we didn't quite make it to the 78.6% level highlighted on the chart. I'm still watching that level as downside support should we see further weakness in the market early this week. Will the 200 day MA be all we get on the downside for the SPY? No rejection yet, we are just messing around with it as a pivot for now. First resistance up here to watch is 1291.50. that;s the 38% retracement of the last nice sized swing down. One of my favorite entries used to be using the first 5 minute breach, but it hasn't been as effective as it has in the past. Today for example, if taken would have been a quick stop out. I'm using other tactics for entries and exits, and they are based on dynamic levels, rather than static ones. I'm not throwing the old tactics out, as they are still effective, but I'm trying to narrow in for tighter levels to grab on to. By the way, not to stroke the ego too much here, but the techniques you are taught by some of the super guru deluxe training programs are my techniques that were hijacked over the years. They haven't adjusted (they are always late to the party), so be every careful if using those techniques. They don't care, because they just go on gut and feel in their own trading, while pretending to actually have a teachable system to pass along. Here's where my radar gets jammed a little bit. We are starting to push down which is great. Unfortunately, unless we hit 1274.25, the level highlighted in the AM, I'm likely going to leave this fade alone. I would be hesitant at taking the fade here unless we first tested that level. This is a ME problem. I'm not saying the fade wont work unless we test that level, or that the day is over, it just jams me until 10 AM more than likely. For example, off the lows, I got a buy signal that I would have taken 80% of the time, especially off of a fade, but I passed. We just broke a small channel, that may have been an alternate entry, I passed that as well. Maybe that will be for the better, or maybe we scream from here. I don't know. This blog is real life (minus the swearing), not fantasy land. I use this blog as my sounding board. There are a few places you can go where super gurus rule and no one ever loses. They say they are glad they are wrong (when they admit they are the one or two times a year) and spin everything they do as "we knew it!" If that's what you want, go there and ignore this blog, PLEASE. I won't be offended. And here we go. Shoot! 10AM can't come soon enough. I wouldn't mind seeing 1274.25 if the DT oscillator lined up along with it for a nice entry point with confirmation. What I think about the "debt crisis"
I hate politics. I love all the people that sang na na to Bush, and are now ripping Obama as well. Hypocrites unite! I think that there is a very good chance that a deal is made. I don't think President Obama can't take the chance of completely wiping out his reelection hopes. My 2 cents, and how the market reacts is anyone's guess at this point. We should at least try to bounce, but does it start the next leg up? We got the downside continuation I was looking for, but the first target is still 129.63 on the SPY, and we haven't gotten there yet. I'm looking for more downside tomorrow, barring news. Based on how we closed yesterday, I do not think the downside has completed yet. I think we have more downside to be seen before we can get a sustainable bounce. We are getting a digestion day off yesterday's sharp move to the downside. Volume is a bit under yesterday's turnover. two way pushes both turned into good fades for scalps. I didn't like that first push down, so that's a big time hindsighter...hey, a new word! First push above overnight highs was met with selling, as there was no demand, but we are trying again to stick above those overnight highs. Someone wrote me to tell me they took it yesterday off someone's advice. Use stops no matter how good the person thinks they are, they won't be paying you back that's for sure! 1300 holds for now on the S&P futures. We dipped below it for a few tick, but there was no supply so we came right back above. If the SPY closes below 130.72, it suggest a full retracement to 129.63 is coming. 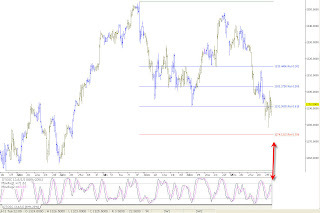 Im watchign tos ee if we get a test of lows and from a double bottom. I may not be here when/if it happens, as I've been in and out al day. How's that super giru 1325 support holding? I guess you wont hear about that anytime soon. Forex is where the biggest scoundrels prey on unsuspecting traders. There is the opportunity to make money trading Forex, but it is highly leveraged and that needs to be respected. Many scoundrels seek to exploit the low deposit requirements. Seems like some notorious scumbags are starting to enter the Forex arena. Be very careful, they are likely getting paid on your trades, and of course not disclosing it. Make sure you get quality education in the Forex market. If not, you will quickly blow up your account, like the nefarious scoundrels who are now pushing it it did. Just ask them to be honest for once about it. I don't get a referal fee, his stuff is just aweosme. He's a great technician, not someone that is using charts now that their "feel" has gone away. It's easy to trade by gut, dreams and feel when everything is flying high, and everyone is making money, isn't it? Andy has no hidden agenda, he just provides a great service. Learn forex from the start and you will be much better off than subscribing to some new service that will either over charge you, or make you sign up with a specific broker in order to get it. What do you think thats all about....duh! The scam artists must think we are morons. Don't fall for the old "I'm a great guy, see how much good stuff I do!" con. This is just the way that the evilest scum on the planet scratch their scabs. Don't donate to their luxury living fund any longer. REFUSE TO BE SCAMMED! CONTACT THE SEC, FNRA and FTC if you feel you have been taken advantage of! We arent crushed, but the breakout absolutely failed as the Bulls could not bring in any pressure and there was no deamnd on the upside. We are a sloppy mess here, but we have the look of a smal cup and handle. if we cna trade above 1333 and catch a tail wind, we could trade to the overnight highs. I'm getting some great feedback regarding exposing the scoundrels and scams going on, and especially the information about the hedge funds. Despite what some might think, Im not talking about one speciifc person in my posts. The more you peel away layers of the onion, the more people you see that are just taking advantage of people, and its disgusting. Do your due diligence and dont fall for the scams! Don't get scammed by listening to the hype! When a monkey throws his poop against the wall, some of it sticks. With an easy gap fade, any high beta names will rock and roll and when ATM options are played you get the juice very quickly. Of course, if they lose, it turns into a swing trade or you don't hear about it any more. Just gross! Check performance of the biggest scam artists and see for yourself. That is of course, if they even their performance listed. If they don't, what are they hiding? Be VERY careful listening to super gurus who are talking about the "secondary markets" this is a new scam they are running, in which they buy up private market shares and then pump and dump them to you. Make them disclose what they own in the private shares market! Pump an dumps can happen on the major exchanges and the private secondary market! Well, I knew it would happen. I received some comments and questions regarding my post from yesterday regarding hedge funds. Here are some quesitons and some follow up. 1) Is there any fund in particular you are talking about in your post? No, it's just a general warning and should be applied to any and all hedge funds, trading pools, managed money accounts and the like. There are plenty of good people out there to manage your money if you choose, but unfortunately some bad apples who think they are invincible can spoil the bunch. 2) What if I already gave money to one of these nefarious cretins (words changed for emphasis lol)? Can you help me get it back? Even though I've helped some people get some money back that was robbed from them from over priced under delivered mentoring and such, I'm not an attorney, I just express my opinion and try to help traders stay away from trouble. If you have already given your money to a fund that you feel is not above board, the first thing I would do is request a withdrawal from them. If they don't allow you to withdraw your funds, contact a lawyer, but just be aware that if they took the time to set this up and know they are lying thieves, they will likely have expensive lawyers on retainer, and try to have you arrested and file injunctions against you and the like. Of course, despite telling everyone that they can't lose, they will go down in flames, but you might have to wait for your money anyway, which you will go to the lawyers anyway. If you can't afford a lawyer, contact the SEC, that will get the ball rolling much quicker. 3) Is there anyone you suggest to invest with? No, I'm not a financial advisor. Just do your DUE DILIGENCE on any and every one you are considering. DO NOT be embarrassed to ask the hard questions. Transparency- Are you allowed to see where the fund stands at any time with just an email or phone call? Is there a reporting system on line for members? Don't get the brush off, you should be able to find out the true up to date performance at any time! Lock up period- You should never agree to a lock up period longer than a few days. Those were all in fashion a few years ago, but if the money manager is doing short term trading, you should have access any time you like to withdraw your funds. Finally, it;s important not to be embarrassed to ask these questions. It;s YOUR money, you deserve to know the answers to the questions that were talked about in these two posts. Don;t be a victim, find out beforehand. Anything else, feel free to email me! Before investing in a Hedge Fund or Trading pool..
Make sure you do thorough due diligence before investing in a hedge fund, trading pool or managed account. Remember, people thought Bernie Madoff was a good guy with a family and all that stuff too. Madoff was also big on charity, just fyi. It's important to ask the people that are trading your money what their risk parameters are. Are they going to be day trading? Swing trading? Using derivatives? Find out if they have ever had a fund before and ask how they did with it. While this is supposed to be revealed in the offering documents, double check. Ask for performance, and ask for a FULL audit of what the managers have done in their personal accounts, not just thrown up as hypothetical results on blogs, websites and the like. Hypothetical don't pay the bills, unless you have a hypothetical mortgage and hypothetical car payments! you will be startled, amazed and shocked at the true performance of the cretins that are really scam artists. Be sure to check draw downs, margin calls and the like. If the fund takes a deep draw down, how will the managers bail YOU out? Finally, check how much skin (their personal money) ALL the people running your money have in the game (the fund). If they don't have skin in the game, ask why not? If they don't have any, are you supporting these people? And if they do have money but choose no to put it all in, ask why? If the fund is so great why aren't they all in? Are they just taking a shot with your money? Why are they now opening a fund? Have they always ran a fund or is it something just to raise some quick cash at your expense? Where is your money being traded? Are you paying higher commissions just so the fund mangers can get a kickback from the broker they are using? That's devious and nefarious. DO YOUR DUE DILIGENCE AND DONT BECOME ANOTHER VICTIM OF WHAT SEEMS TOO GOOD TO BE TRUE! Two of the super gurus top choices for death. I hope no one believed the hype and followed these fools blindly. You will never hear about these shorts again, until the next time they need to raise some quick cash and pump out a new service. Have you checked out Briefing Trader yet? Some super gurus are likely getting all their plays from there and saying that they are original. They dont use their own name so as not to get caught, but it's not hard to figure out! Go right to the source! www.briefingtrader.com This is NOT an affiliate link, I dont get paid if you sign up, I just want you to know the TRUTH, it will be refreshing change from what you are used to if you are following these super gurus. See for yourself and save money by not being front run or getitng a worse price due to the delay! Forced continuity refers to signing up for something that is supposedly free, but if you don't cancel in time, you have to pay. It entails giving your credit card information in order to get free access to something, and then you get slammed into paying for something you don't want just because you forgot to cancel. It's the highest form of low lifeness, but its what many of these scam artists do in order to support their business and gambling habits. They make you sign up to high priced services (where you can get a car for the money you are paying) or low priced newsletters and such so that they slip under the radar and you dont notice the charges. This has paid for more houses on country clubs, sushi, and private schools than you can imagine, and its just plain wrong. Recurring billing is not an issue, as many people feel subscriptions keep things running smoothly with no interruption in service, but offering a free trial and then slamming you into a program is downright scummy. Did you expect anything else from these people? REFUSE TO BE SCAMMED! if you feel you are being put into a forced continuity program, contact the FTC immediately and they will help you resolve any complaints and put these scum out of business. Trading isn't get rich quick. its a busienss nad it needs to be treated like one. LOL! It's amazing how desperate people are to hang on to their scams! I just gave away 10 minutes of my life reading the biggest horse poop of my life. I'm glad I havent eaten lunch yet, because I would have puked up the greatest sandwich ever! PLEASE! I know that many of you who fall for this scam artist's nonsense also read this blog. DO NOT BELIEVE ANY OF IT FOR A SECOND, ITS ALL LIES TO GET YOUR MONEY. Business is business. You pay people for information, but draw the line there. Don't let ANYONE con you into thinking they are a great person when they are the farthest things from it and only focus on how they can scam you out of more money. If there is no performance to back up the hype, do not pay any more! These people have NO SHAME! They reference people that they disowned and abused, and use them to make you feel sorry for them. They are the ultimate users and they will use you too until you are drained, and then they will BLAME YOU. I've seen it done too many times! DONT FALL FOR THE SCAM! It's just a game folks, the actions of these scumbags speak much louder than the words they write. The great news is that it wil all be over soon. Some moves are in play and they will probably be shut down in a matter of months. They won't be able to hurt anyone for a while, but they always find a new way! Stay safe and DONT BELIEVE THE HYPE! IT WILL COST YOU YOUR ACCOUNT! It's easy when we go straight up to pick any calls isn't it? Only +1700s now, which is still strong, but off the highs. Ouch, no mention by the super gurus on that one, even though they recommended it for free! One more push to come? The highs may be in, but breadth hasn't made enough of a move to confrim that the highs are in for sure. Price action showing rejection here. Don't get scammed when choosing a broker! If you are following a recommendation from a super guru or his henchmen regarding a broker, make sure you are doing your due diligence. Many of these scumbags have paid money to lawyers to start fraudulent lawsuits and persecute those that express their opinion, but they don't take the simple steps to ensure that they are following the directives from the NFA, SEC or FINRA. If they are getting paid from a broker, whether it be stock, options, futures or Forex, they must disclose the relationship in "easy to understand" language. Some of these cretins got away with murder a few years ago, getting their siblings, in laws or best buddies to be registered while they were paid under the table. Thanks to some people stepping up and making complaints, I'll bet that they are now under the watchful eye of many of the regulatory commissions. Here's a way to check to see if any of the people that are "just telling you who they prefer" are really getting paid for you doing trades at these brokers. They then will call a crazy amount of trades so that win or lose, they still make money on you before you wise up. While highly illegal, these idiots think that an insurance policy and a half assed opinion from a horrible attorney will keep them out of trouble. Good luck with that! P.S. Be especially careful with Forex. The way that it is setup, these clowns actually make money when you LOSE, so they are rooting against you and may give poor advice so that they make money. this applies to even the ones that act all nice and helpful. Nice, huh? Look up your favorites by name and see how they are preaching one thing, but doing the other. You will be surprised at how scummy these people can really be. Charging you for services, but then looking to get paid as your broker too? Sounds duplicitous to me. Be safe and don't fall for the scams! If you feel you have been mistreated, report the deviants right away, you will be helping many people before they get scammed themselves! Now we'll see if the bulls are for real here. The first half hour break was to the upside, let;s see if the first hour range gets a break that way as well. I got some nice emails regarding my crappy day post. Im glad that it helped some of you, and to the one person who said I deserved it Þ to you! I was up until 6AM working on some projects, so I missed what turned out to be a nice day, as it followed the script pretty nicely. I slept in and hung with the kids, but I'll be back in fornt of the screen on Thrusday. By the way, I'm not "predicting" that it's headed lower tomorrow, I just love how the perma bears a few weeks ago are all cheering the praises of AAPL and tech. The loudest ones were screaming "RENN is a BUY!" and "AAPL is a SHORT!" and "we are in serious trouble!" and they leave a herd of sheep slaughtered in the aftermath as they couldn't read the stock market trends if they had Cliff notes. Be careful, you can get hurt following these hucksters, no matter how many times they modify their facebook pages and blogs to make it appear that they have never lost a trade in their life. And if you think it's me with an axe to grind, get real. Go do a search on twitter for Apple and see how many got burned or are telling it like it is about these scoundrels. Can't shake the crappiness of the day off, so I'll write about it. I started the day off well, I passed on the fade and took some trades off the divergence at highs early on. Then I got stubborn, and didn't see that the President was set to speak, so I shorted anticipating a breakdown. As soon as the trade started to creep against me and I found out about the President speaking, I should have immediately gotten out and took the small loss, but I held through, scalped around the position, and wound up not gaining any ground as the market kept going up in my face. Classic trend fighting like a complete chump. My only consolation was that I kept it small, and Ill be back to fight another day. What I hate more than losing is losing because I broke my rules. Losing is part of the business, but ignoring the rules should not be. I'm NOT happy right now. If I followed my rules, maybe I lose later on, but maybe I wind up staying flat and booking my profits that I had earlier instead of sacrificing them in the name of stroking my ego and trying to pick a direction without confirmation. I don't suggest that as a trading plan to build a business off of, but hey, maybe that's just me. Anyway, I would love to go hit the punching bag, but I might break a fingernail. Thank goodness there's no ice cream in the house or I would be freezing my brain right about now. Time to go play with the kids, that always cheers me up! uh oh, getting peppered here off earnings! Close at highs or pull the rug? 75 minutes to go before the market is closed for the day. We are seeing a strong move in the market here. Bull flag or highs in? I think I already guessed at the highs being in, didnt I? Not sure if we rip it up the rest of the day, but breadth is almost +1600, not something to just brush off as neutral! Rick, J-P and Witch Doctor are top notch traders and analysts, and actually know what they are doing! They don't guess at what will happen, and then deny it when it doesn't. They also have losers and they don't avoid them or take off posts from the site when they do lose. They understand it's part of the trading business, and they never claim they are perfect. For $30 a month, it's a steal, and they have a free trial! Full disclosure: I do not get a referal fee for sending people over, but I would like to know if you checked it out and what your thoughts were. I've sent hundreds over there already, and did actually have one complaint, along with many thank yous from people I saved from getting ripped off at other super deluxe, over promised and under delivered hype fests. Why the one complaint? Because everyone is different and has their own opinions, some that even conflict with my own! A whopper of a pull in! Not! We went a total of 2.5 points from the high! Breadth is +1600s, the gap fade didnt work (surprising since all the super hype is that gap fades are the holy grail) but it looks like we could get a pull in here, but who knows how deep it will be. Man, the lies just never ever end! Everyone thinks they blow out, but if they do, who will be left to buy? $TICKs saw -1300 on that last push down. Flush out anybody? Have I said that yet today? I'm not trying to be tunnel visioned here, it just looks like a magnet. But will we hit my magic 1295.25? Disclaimer: it's not a magic number! It;s been a boring day so far, but I'm keeping in eye on yesterday's lows here. So far we have formed an inside day, but that might change this afternoon. I'm not looking to short a break of yesterday's lows right off, I want to make sure that there is a way to quantify the risk, so Ill watch for a pattern to set up first. Current pattern suggests that yesterday's lows are tested. Happy Bastille Day!- yes I know It's a day early! Sorry for the lack of posts on Wednesday, Ill be back in front of the screen on Thursday and Friday. Yes, it may be heathly for the market, but you werere just saying last week how we were going to crack new highs afer the Jobs report! Ah, the hyporisy never ends! After preaching to never hold over earnings, it was a spur of the moment call. By the way, if you think Im being hyper critical and claiming that I'm never wrong, spend some time and read this blog. I'm wrong, and quite often at that. It's part of this business. There is NOTHING that works every time. Charts, fundamentals, past trends, etc. Making bold predictions is great if no one gets hurt following them. When people get hurt because you are bragging and act like you've never been wrong then it's an issue. Especially when you are dead wrong and then crow that you were right. I would much rather read someone that is consistent, right or wrong. And yes, that's what I strive to be, but I will sometimes get side tracked and screw up. In the end , you have to make your own decisions. It's fine to read what others have to say, even me! LOL. Use what you read and formulate your own opinion. I have a few people that read this blog and email with me that totally disagree with what I have to say soemtiems. Guess what? Sometimes they are right, and sometimes they are wrong. Sounds like trading to me. Got a dip just below 1311, and then, bouncage! I can't wait to hear the spin tonight! I'm sure it will be changed to "I thought something like this might happen, that's why we use stops ......."
These nitwits are always late to the party! Whats wrong with waiting to see how we act at Friday's lows, or seeing if there is any follow through from Friday's weakness. Instead, they say: let's gamble! Easy for them, it's not their money anyway and they will just charge you for another class or super deluxe list! Get an education, but don't get scammed! Time To Quit Stock Trading? Lately I've gotten some emails from traders regarding frustrations with their stock trading. Just when it was looking like we were going to rip it higher, Osama Bin Coward had justice delivered upon him, and we pulled back for several weeks. Then, just when it looked like we were going to break down, the market got a nice bounce, likely fueled by super deluxe short lists and my super secret indicator, as well as negative sentiment. We quickly got overbought, but rather than get a retest down, we squeezed and knocked the Bear's teeth down their throat. So, is it time to quit stock trading? Despite what some will tell you, the market doesn't follow an exact script. That's why it's important to put the work in every single day, and follow a routine. This way, no matter what curve ball the stock market throws at you, at least you have a plan. I hate to harp on it, but developing a trading plan and keeping the discipline are so important, much more important than any custom indicator or black box algorithm. In the end, only you can decide if you should continue stock trading. Just keep in mind that if you are going to keep trading and just choose another financial market thinking that's the answer, every market will need the same discipline and trading plan. There are no shortcuts. If it were a easy as the super gurus say, then NO ONE would make any money. Well, the market is doing EXACTLY what I thought, if the open was 8:30! Hey, what's an hour between friends, right? Horrible job numbers and the market slipped down the wall of worry, at least for now. Is this push up over? It could be, but still using the 78.6% rule, it would suggest we eventually take out that Osama Bin Coward high. But here's a question: how many days are in an eventually? Sorry for the extra dose of sarcasm today, it's been one of those weeks! The new site is in beta, if your really want to see it and give me feedback, shoot me an email at tinymjs at gmail dot com. I'm working on a "quick and dirty" Fibonacci video, because that's the topic I seem to get the most questions about. I should have that ready to go next week. That's all for now, I'm taking the kids to lunch. It sure beats dropping them with a random nanny any time! There's no trigger here, it's just an observation, and I could be dead wrong. OK, so why am I even bothering to say it? Because there's nothing wrong with trailing a stop if long to protect profits. We are now above the line in the sand level that I have been speaking about over the last few days. this suggests that we retest the previous highs. Overall volume is on the light side, but it's not stopping the bulls. We are sitting right at previous resistance here on the daily chart. Im here! I slept late, missed the day, but it doesn't look like it was much of a miss! Just more news hype for now! Work done, or more to come? So much for those overnight highs being tested! Down volume is still outpacing up volume here but not by very much. This suggests that IF the overnight highs are tested, it could be a work done situation. That changes if volume breadth improves. A-D line is just under +200 here. Nothing big, but we just went green so not much to expect there yet. And there is the new reaction high. Market trying to push up into lunchtime here, but will it do anything? The consensus from what I've been reading is that people are looking for that 1328.25 to lean against for longs, but maybe they all front ran it by a point. there's a tried and true saying about he stock market. It goes like this: "The market climbs a wall of worry"
Another country or three in Europe talking about going under? Check! Unemployment actually NOT getting better as previously stated? Check! Housing still in the toilet? Check! That all spells worry to me, and the market reacted appropriately, with a 5 day in a row pop who's size hasn't been seen in years. I was certainly wrong a few times this week. While I didn't think we would fall out of bed, I was looking for a bit lower to be tested. I was looking for a bounce Monday for a number of reasons, the most prevailing being that there was so much negative sentiment out there. After we bounced a bit and quickly got overbought, I was looking for a retest back down and it never came. If you check the videos you can see that I definitely had a short side opinion, and thanks to respecting the triggers it only wound up costing a half unit loss, but more aggravating to me was no watch list trades to the upside as we got overbought pretty quickly and that kept me out of chasing the upside. Oh, that was only after 40 S&P points ago! Do I think the rally is over? I don't know. I still believe that we form a range over the next few months rather than an all out screaming rally or decline. A pullback here is due, and depending on the breadth and volume of that pullback, it will go a long way in my analysis of the next move. P.S. I also have a secret indicator. Hint: It's based on "never admit they are wrong" super gurus touting the death of the market. They are wrong a good 90% of the time, and when they get lucky it's all you hear. You will never hear them say "hey I got it wrong, sorry". They just keep on saying how they nailed it, and they delete blog posts and status updates so you can't see how wrong they truly are. When they start leaning one way, I know a reversal is due. They will usually catch the end of the move, not the start. Where are the super bears with their deluxe short lists? What will be the excuse THIS TIME? REFUSE TO FALL FOR THE SCAM!